We have added a live chat feature to our site! In the lower right corner of our Web site, you will see a bubble that says “Need help?” Clicking that will connect you to someone in our office during most normal business hours. There, you can ask a question, get information, or leave a comment. It’s always free to chat with us! This is an example of a an email you want to check out before you click (like we discussed in this post) This potential phishing email is telling you that someone wants to be your friend. It’s not from a bank like our last example talked about, it actually looks like it’s coming from a online community that you (supposedly) belong to. But do you know who this is? 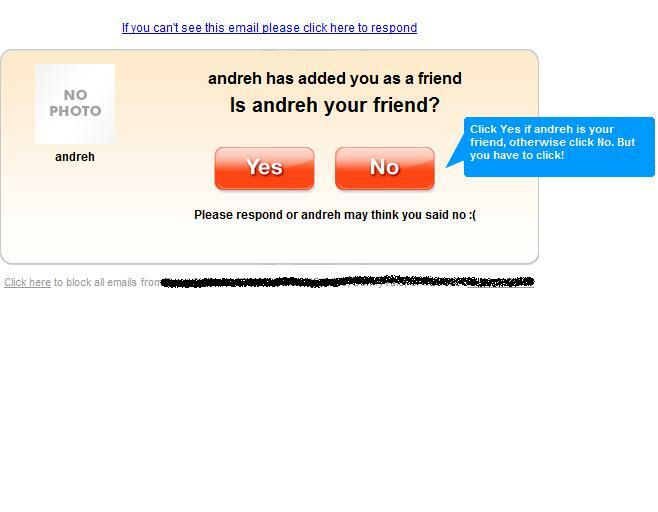 Do you recognize the site that sent you this friend request? Probably not. I received this email and I have never heard of this ‘community’ or ‘friend’. See the blue bubble box that is teling you that you have to click? Remember – You never have to click! With all of the springtime storms that have been rolling through our area last week, I thought I would talk about power surges, power outages, and protecting your computer equipment. There are a couple of things you can buy to help you protect your equipment and help prevent potential damage – Surge protectors and battery backups. You can find these at most retail stores that sell computers or accessories. We all get them – Spam emails. These emails come into our Inbox uninvited and tell you that you that you have won a lottery (that you didn’t enter in a country you don’t live in,) promises to help ‘enlarge’ certain areas of our bodies, and win lots of free things. We delete them and grumble a bit, hoping never to see them again. We know that these are phishing scams and that we shouldn’t respond to them. But some phishing scams aren’t so easy to detect. For example, you might get an email from an address that looks okay and you can’t tell that it’s “Spam”. Sometimes it says that you purchased something and the email wants you to click the link to verify the purchase. Other times you might receive emails from your “bank” asking you to renew your online banking password or dispute a charge. You may actually bank with this company, and the email sounds alarming so you might be inclined to click and see what they are talking about. Before you click, look at the link the email wants you to click. Is it really leading you to where you think it is? I found a great article from Microsoft about how to recognize phishing e-mails or links to help you see what I am talking about. Following those guidelines can help you protect you and your computer. Identity theft is a huge problem and “phishing scams” like these effect people all over the country every day. Be careful about what you click! © 2019 Computer Doctors is proudly using the Lysa theme.